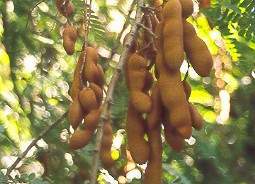 Tamarind (Tamarindus indica) is a tropical cultivars including plants and fruit pods. Loud enough trunk can grow to be large and shady leaves. Loud enough trunk can grow to be large and shady leaves. Long-stemmed tamarind leaves, about 17 cm and finned even. The flowers are yellow and a reddish brown fruit pods with a distinctive sour taste. In addition there are the pods of skin that wraps pulp, seeds are also numbered 2-5 to flat shaped somewhat blackish brown color. CHEMISTRY CONTENT: Fruit tamarind pods containing chemicals such as acid apples, citric acid, wine, tartaric acid, succinic acid, pectin and invert sugar. Tamarind fruit that ripen on the tree of which contains the value of calories by 239 cal per 100 grams, 2.8 grams of protein per 100 grams, 0.6 grams of fat per 100 grams, 62.5 grams carbohydrate per 100 grams, calcium 74 milligrams per 100 grams, 113 milligrams phosphorus per 100 gram, 0.6 milligrams of iron per 100 grams, vitamin A 30 SI per 100 grams, vitamin B1 0.34 milligrams per 100 grams, 2 milligrams of vitamin C per 100 grams. Phlobatannnin skin and seeds contain albuminoid and seeds contain starch.